The S5 HD Security Patrol Robot is designed to patrol well-lit territories or large premises. The mobile robot is equipped with six high-definition cameras to form a continuous 360-degree panoramic view with extremely high resolution. The robot provides high-quality video surveillance while in motion and when standing still. High-frequency vibrations caused by movement along rough roads that may otherwise result in picture deterioration with other camera applications are efficiently absorbed by the robot’s suspension. With sufficient illumination, the quality of video image allows the robot to carry out security surveillance, visually inspect equipment, and ensure safety of goods. The 360-degree panoramic CCTV system is installed on the S Series Autonomous Unmanned Ground Vehicle. With the mobile video surveillance system mounted on a vehicle, this unit can patrol territories, change its route depending on emerging threats, and survey a facility’s peripheral areas. A mobile surveillance robot is indispensable when you need to oversee fast or dangerous works. 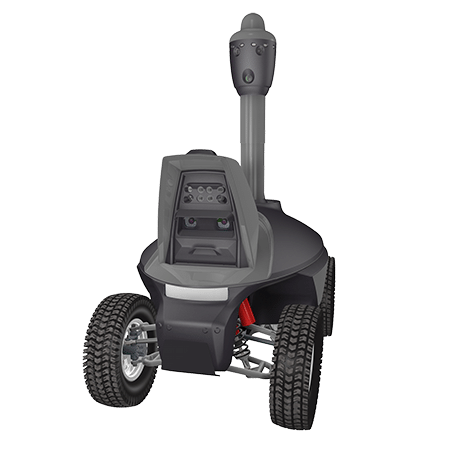 S5 HD Security Patrol Robot can patrol territories without human input. 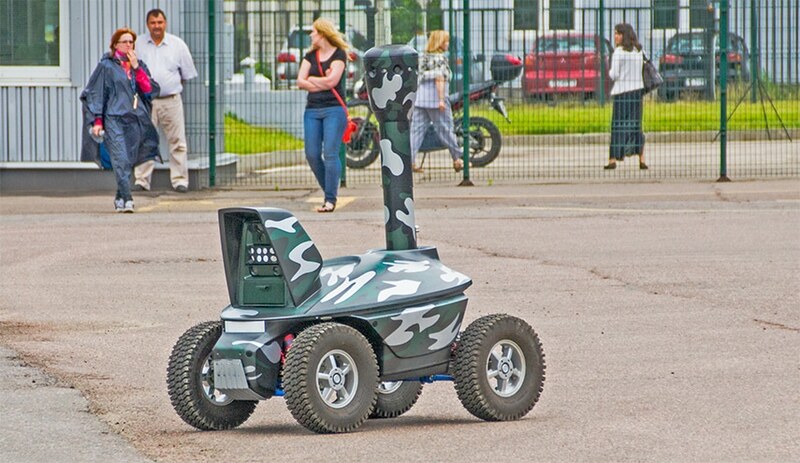 The unmanned vehicle used for transportation can successfully move along paved sidewalks but must not be used on public roads or in crowded locations. 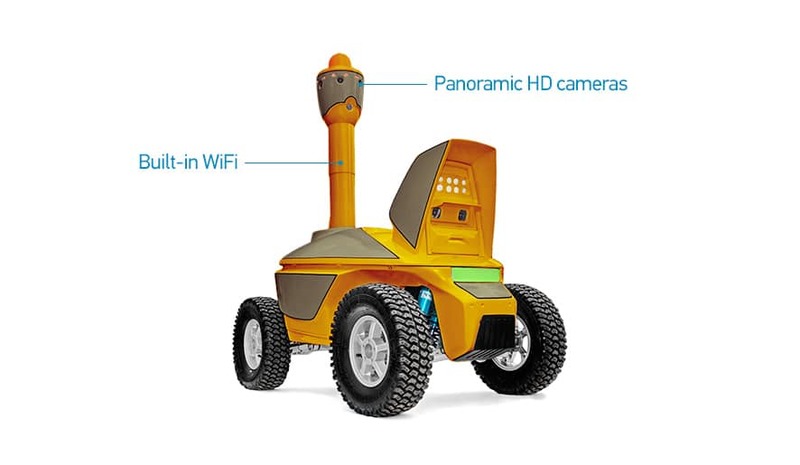 The security patrol robot provides for remote video surveillance using WiFi wireless data transfer technology. The integrated WiFi module transmits images captured by panoramic HD cameras installed on the robot. Thanks to the omnidirectional antenna installed on the robot, the robot can transfer data to its base station from a half-mile away. Install relays to improve the radio coverage area may be needed in areas with large obstacles, such as buildings or heavy haulers. In any case, wireless communication failures only affect the viewing of the feed from the surveillance cameras. Regardless of environmental obstacles, the robot will continue moving, eventually leaving any poor-reception area. Data captured by digital high-definition video cameras is recorded on the HDD of a digital video recorder built into the security patrol robot. The capacity of the HDD is sufficient to record a week-long video of the robot’s patrolling. To view recorded video archives, the digital data needs be copied to the operator’s desktop. Due to the large data size potential, it should be copied during scheduled recharging of the robot. Small portions of the video archive can be copied via WiFi while the robot is patrolling. However, keep in mind that the channel bandwidth is limited. So, copying and simultaneously watching even a short fragment of the high resolution video feed may take a long time. When patrolling the territory, the robot uses the built-in WiFi module to transmit digital data to a fixed wireless access point. The data is then relayed to the Central Monitoring System of the facility’s security service via a wired Ethernet channel. The same data may be accessed from a mobile computer by an onsite security officer or by a remote user authorized to access secure data exchange over public internet channels. Apart from the surveillance camera’s video feed, the patrolling robot sends the following data: its current location on the map of the secured facility, the state of its electronic systems, and its battery capacity. 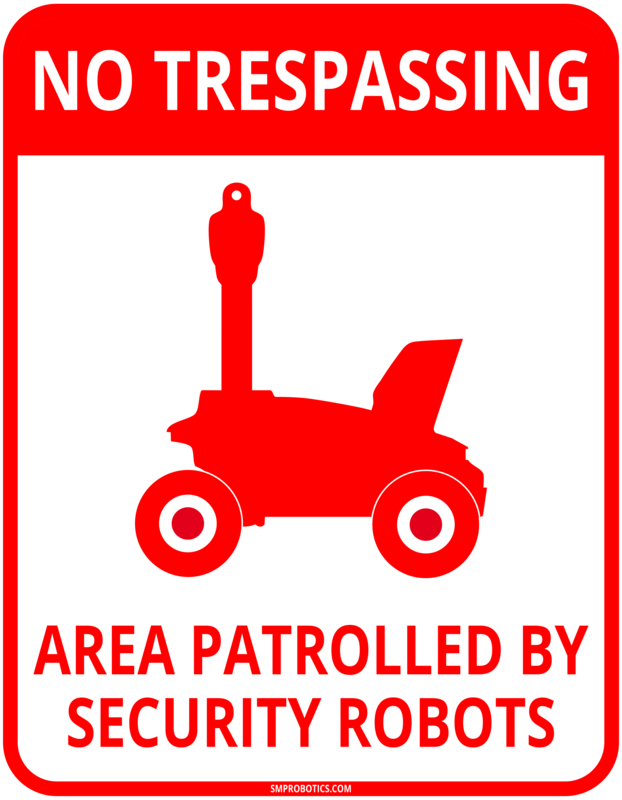 The authorized user can to change the robot’s patrol route, select a camera to show in high resolution, or trigger a light and audio alarm. As the robot is patrolling the territory, its batteries deplete. When the charge is critically low, the mobile robot automatically heads toward its onsite charger. During operation and at recharge, states of the robot’s systems are displayed by the external color indicator that can be seen clearly from a distance of more than ten feet. The indicator shows battery capacity, maneuvers of the robot when it is moving, the internal temperature, availability of the wireless connection, and errors in the robot’s systems. The operator switches the robot on and off using a removable mechanical key that is inserted into the key hole located on the robot’s diagnostic panel. The diagnostic panel contains back-lit, transparent displays showing the state and health of the robot’s electronic blocks. This information is used for quick diagnostics of the robot in case of its failure. In case of automatic guidance system failures, the robot switches into its emergency mode used to manually recall it from its route. 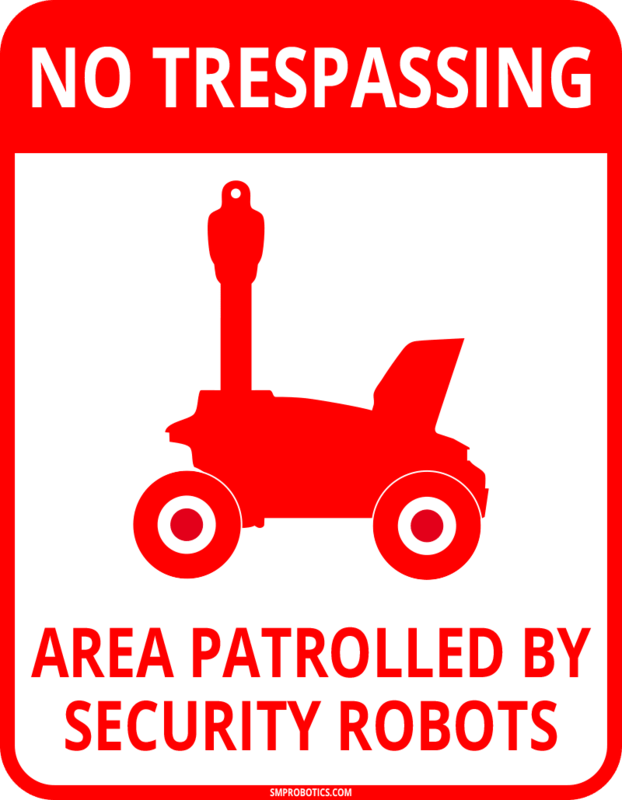 The security robot’s guidance is based on recognition of visible landmarks around the robot and its positioning according to the layout of these landmarks. 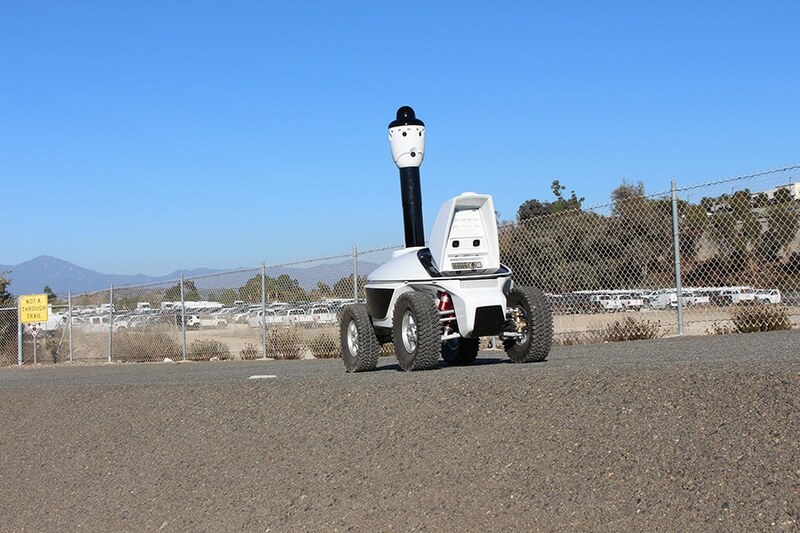 This technology allows for reliable positioning of the robot among artificial structures located on the territory to be patrolled. The best patrolling route for the robot is a closed circuit running among sparsely placed buildings and small strips of planted land. 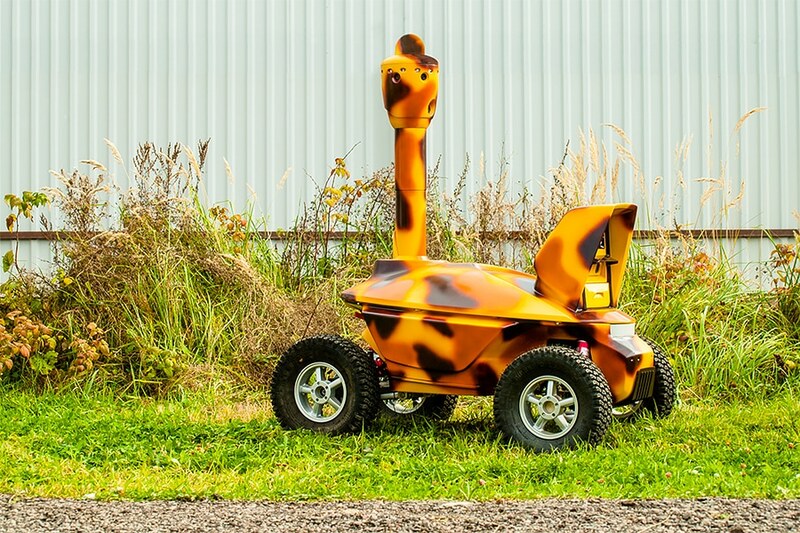 Although you cannot rely on seamless reception of GPS signals in such a territory, visual navigation provides for accurate guidance of the mobile robot along its patrol route. The visual navigation is based on positioning among the objects captured by digital cameras. Natural light during daytime is sufficient, while artificial lighting at night or when indoors is required for correct operation of the robot’s camera. A lighting level of at least 10 lx is required for reliable operation of both the video surveillance system and the autonomous guidance system. 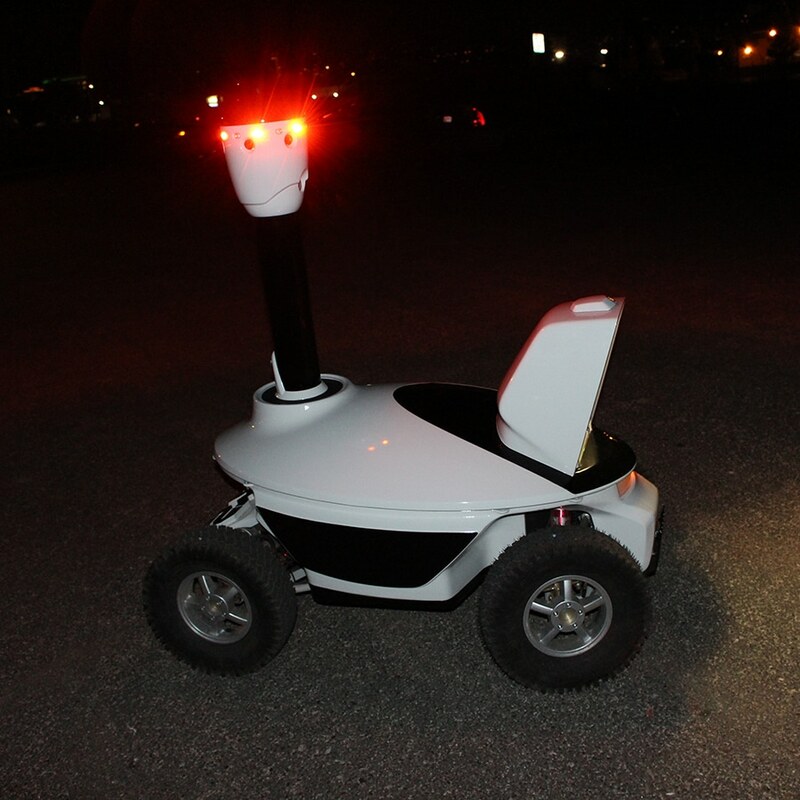 The patrolling robot is equipped with a headlight for illuminating its path. The LED headlight provides illumination necessary for correct operation of the stereoscopic cameras used to detect and avoid obstacles. The headlight is turned on automatically to illuminate portions of the patrolling route that are otherwise insufficiently lit.